We are at a crucial moment – we can continue to let water quality become worse or we can work together to reverse the damage that has been done and prevent future water degradation. Minnesota has a very unusual geographic position. We sit atop a triple, continental-scale water divide. Almost all of our water arrives as rain or snow. 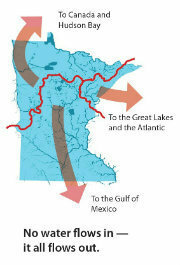 We have some very high quality waters, but Minnesota also faces some serious challenges. Three out of four Minnesotans get their drinking water from groundwater sources, but groundwater is threatened by overuse and contamination in some places. Nitrate is one of the most common water pollutants in Minnesota groundwater, affecting a large number of private wells and public water supplies. Elevated nitrate in drinking water can be harmful to human health, specifically to the health of infants. Septic systems, fertilizers, and manure are major sources of nitrate pollution in Minnesota. Statewide, 40% of the lakes and streams in Minnesota are not meeting standards set for safe swimming, fishing, or drinking. In the northeastern part of the state, a higher percentage of lakes and streams meet water quality standards, compared to central or southern regions. Water quality in a body of water depends a lot on the land around it. In watersheds dominated by agricultural and urban land, half or fewer of the lakes fully support the water quality standards for swimming due to contaminants from runoff and drainage. Runoff in urban areas and drainage from agriculture fields move water into streams and rivers quickly, increasing the speed and volume of water in streams and rivers. Sometimes these flows bring pollution that might otherwise be removed by wetlands or other landscape features. Our infrastructure is badly in need of attention. Water systems are aging. Many equipment and pipes are at the end of or past their expected life span. Over the next 20 years, Minnesota will have some big bills to pay to upgrade wastewater and drinking water infrastructure. We will need to decide how to equitably pay for these costs. Water quality issues vary by region depending on geology, land use, and other factors. 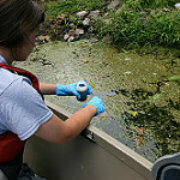 You can find more details about water quality issues near you in these information packets. Northwest Minnesota: Becker, Clay, Grant, Kittson, Mahnomen, Marshall, Norman, Otter Tail, Pennington, Polk, Red Lake, Roseau, Traverse, and Wilkin counties. West Central Minnesota: Big Stone, Chippewa, Douglas, Kandiyohi, Meeker, Morrison, Pope, Stearns, Stevens, Swift, and Todd counties. Northeast Minnesota: Aitkin, Carlton, Cook, Kanabec, Lake, Mille Lacs, Pine, and Saint Louis counties. Metro Minnesota: Anoka, Carver, Chisago, Dakota, Hennepin, Isanti, Scott, Sherburne, Washington, and Wright counties. Southwest Minnesota: Cottonwood, Jackson, Law Qui Parle, Lincoln, Lyon, Murray, Nobles, Pipestone, Redwood, Rock, and Yellow Medicine counties. South Central Minnesota: Blue Earth, Brown, Faribault, Le Sueur, McLeod, Nicollet, Renville, Sibley, Waseca, and Watonwan counties. Southeast Minnesota:Dodge, Fillmore, Freeborn, Goodhue, Houston, Mower, Olmsted, Rice, Steele, Wabasha, and Winona counties. North Central Minnesota: Beltrami, Cass, Clearwater, Crow Wing, Hubbard, Itasca, Koochiching, Lake of the Woods, and Wadena counties. What do you hope the water is like in 2025? At the current level of effort, there will be only a 7 percent improvement in water quality statewide by 2025, and without further action, water quality will get worse. 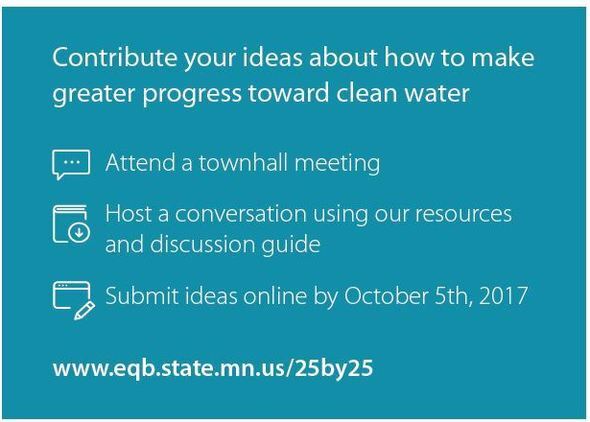 That's why Governor Mark Dayton is calling on Minnesotans to learn about these issues and share their ideas with him for “25 by ‘25” Water Quality Goals, which would spur collaboration and action to improve Minnesota’s water quality 25 percent by 2025. Connect with your watershed organization for education, volunteer opportunities, technical assistance, and connection to financial resources. Non-metro organizations are listed on the last page of each regional packet, linked in the section above. Thank you for reading Living Green 365. 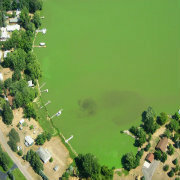 This newsletter is a publication of the Minnesota Pollution Control Agency. Send questions or comments about living green to the address below.